1942 “Regulations Controlling Travel and other Conduct of Aliens of Enemy Nationalities;” United States Government Printing Office, Washington, DC: 1942. On July 15, 1942, the S.S. Drottningholm left Pier F, Jersey City, New Jersey bound for Gothenburg, Sweden, where internees were sent on to Germany and Italy, to be exchanged for U.S. citizens. An assortment of papers related to that exchange are listed here, courtesy of Shelby and Stephen Concepcion. Hull to Biddle, 9 Nov 1942, 740.00115 EW 1939/4570, RG 59 Central Decimal File, 1940-1944; Box 2835—250/32/19/02 — discusses problems with repatriation process. 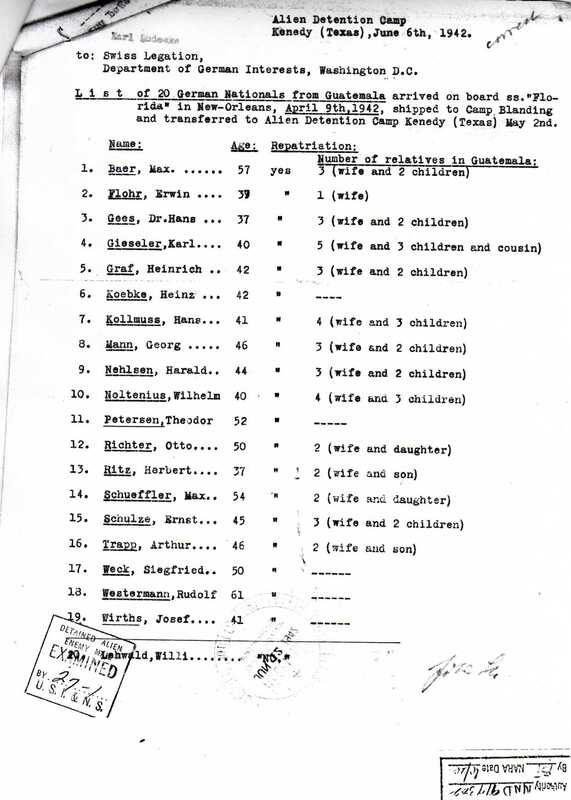 1942-43 “detailed official” State Department lists of people of German ethnicity ordered interned—include name, date and location of birth, address when taken, next of kin and their address, occupation, and place of internment as of a specific date. Compiled by the Provost Marshal General’s Office, War Department. All are found in NARA, RG 59, State Dept, Special War Problems Division, entry A1 1357, Subject Files 1939-55, Box 199. 16 July 1943 memo Francis Biddle, Attorney General to Hugh B. Cox, Assistant AG and J.E. Hoover, FBI, declaring custodial detention lists “inherently unreliable” and stating they should not be used. J. Edgar Hoover to Major General Edwin Watson, 10 Dec 1941; Archival Document package “FDR and World War II,” Franklin D. Roosevelt Presidential Library — FBI report on number of Japanese, German, and Italian aliens in custody as of 9 December, 1941. Crystal City, Texas Family Internment Camp map annotated by former internee Werner Ulrich—includes plot plans, drawings of building types, and location of work areas, as well as lists of internees held in the camp, births, and deaths. Staff, including teachers and medical personnel, are listed. Which cottage each interned family lived in is also shown. 3 Dec 1943, 30 May 1945, and 29 Mar 1946 reports on the facilities at Ellis Island, including the haste and confusion surrounding a mass deportation and the inadequacies of the facilities for long-term detention. NARA RG 59, Dept of State, Special War Problems Division, Entry 1352, Inspection Reports, 1942-1946. 29 Feb 1944 census —NARA, RG 59, State Department, Special War Problems Division, Entry A1 1357, Subject Files 1939-55, Box 191. 25-28 June 1942 inspection report of facilities and care inmates were receiving shortly after the camp opened was highly critical. 1942-43 “detailed official” State Department lists of people of German ethnicity ordered interned—includes place of internment as of a specific date, as well as date and location of birth, address when taken, next of kin and their address, and occupation. Compiled by the Provost Marshal General’s Office, War Department. All are found in NARA, RG 59, State Dept, Special War Problems Division, entry A1 1357, Subject Files 1939-55, Box 199. Donovan to Franklin Delano Roosevelt, 26 Mar 1942—report from head of Office of Strategic Services, (precursor to the CIA), about “secret map of South America,” dividing Latin America into five sections, “which will be conquered or come under complete Nazi control.” NARA: Collection FDR-FDRPSF: President’s Secretary’s File (Franklin D. Roosevelt Administration), 1933-1945, Subject Files 1933-1945, Office of Strategic Services Reports, March 26, 1942-April 13, 1942. White to Lafoon memo, 30 Jan 1946 “Statistics,” Subject Files 1939-54, Box 70, Special War Problems Division, RG 59, NA — gives numbers and ethnicities of Latin Americans brought to the U.S.
“Agreements with enemy countries for the exchange of officials and non-officials.” United States Department of State/Foreign relations of the United States diplomatic papers, 1942. General; the British Commonwealth; the Far East (1942); p 285-449. University of Wisconsin Digital Collections. 18 Aug 1942, Report on Visit to Detention Stations for Civilian Internees in the United States of America (25-28 Jun 1942); Dr. Max Habicht, Delegate for the War Prisoners of the Legation of Switzerland, Washington, D.C. 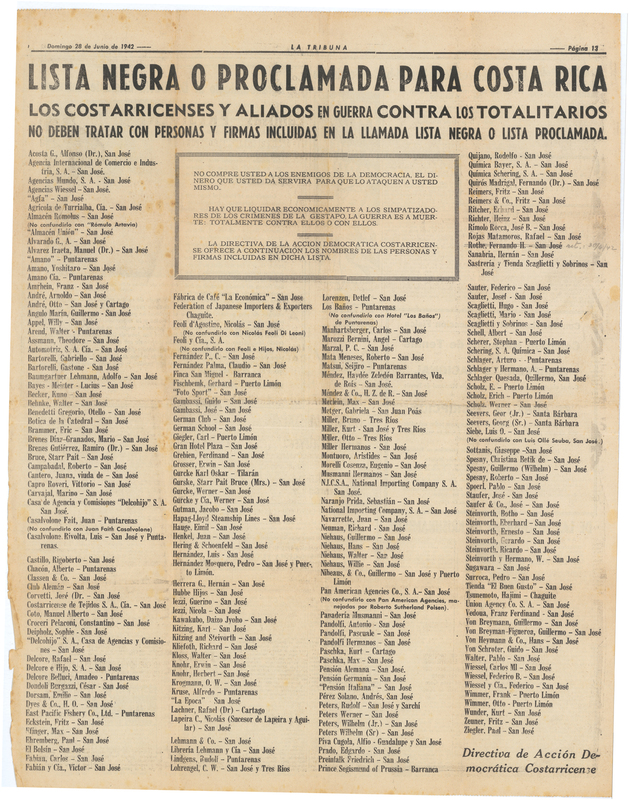 The Proclaimed List of Certain Blocked Nationals: Revision II, May 12, 1942. United States Printing Office, Washington, 1942. Found on Fraser Federal Reserve Archive website. (The list begins on page 3.) Also see Blacklists provided by internee families under The Special War Problems Division, Latin America. The Internment of German and Italian Aliens Compared with the Internment of Japanese Aliens in the United States during World War II: a Brief History and Analysis. Peter B. Sherman, analyst in American National Government, Government Division. 24 Nov 1980. These are only a few of the many ships carrying Latin Americans to U.S. internment facilities. Some are large documents and may take additional time to download. All manifests were found on-line. New Orleans Passenger Lists, 1820-1945 [database on-line]. Provo, UT, USA: Ancestry.com Operations, Inc., 2006. Original data: Passenger Lists of Vessels Arriving at New Orleans, Louisiana, 1903-1945. Microfilm publication T905. 189 rolls. RG 85, and California Passenger and Crew Lists, 1893-1957 [database on-line]. Provo, UT, USA: Ancestry.com Operations Inc, 2008. Original data: varied; Records of the Immigration and Naturalization Service, RG 85; NA. These photographs show a few of the vessels used to transport internees to the U.S. or to Axis countries during WW II. Found on-line through Ancestry.com. Passenger Ships and Images [database on-line]. Provo, UT, USA: Ancestry.com Operations Inc, 2009. Original data; various reference sources.